You have never seen Laura Darley's picture on the front page of the Courier Herald. People like her rarely wind up on the front page of any newspaper. That doesn't mean that you won't recognize her if you see her. Many of you have eaten lunch with her. You may have seen her in the lunchroom at Northwest Laurens Elementary. 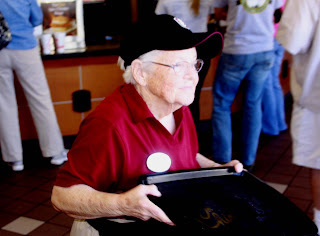 But, if you don't know who Laura Darley is, just go over to Chick-fi-La for lunch and you'll find her patrolling the place, policing up the fallen crumbs and abandoned trays, and keeping the whole place tidy and neat, just like your grandmother would. 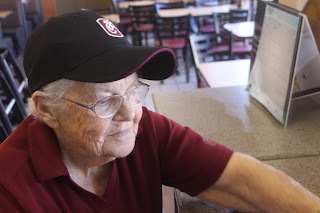 Laura Darley has lived in Laurens County for almost all of her eighty-five years. She grew up on a farm near Rockledge. Life was tough for Laura's parents, Ashley and Tiny Stewart, during the Great Depression. After she graduated from Wilkes High School, Laura married Johnnie Darley. They had seven children, five boys and two girls. Johnnie died way too young in 1970. During her four decades of widowhood, Laura Darley kept on working. She worked in and outside of her home. Despite the fact that she had seven of her own children, Miss Laura took in at least five foster children, including a six-month-old baby. When she was looking after her own children, Mrs. Darley worked for almost two decades in the lunchroom at Northwest Laurens Elementary. After leaving the school, Laura took a job at Quincy's Restaurant in Dublin. She worked along with her son Doyce, who was the one who cooked those fabulous, triple-buttered yeast rolls that put a smile on our faces and inches on our waist lines. "When I worked there, my family would always ask me to bring them some home when I got off work," Mrs. Darley, who only worked at Quincy's for a short time, fondly remembered. Then in the middle of April in 1999, Laura's life took a change for the better. She took a job at Chick-fi-la. "I went over and applied for a job and Mr. David Roberts hired me," Laura recalled. Roberts had a plan for Laura. 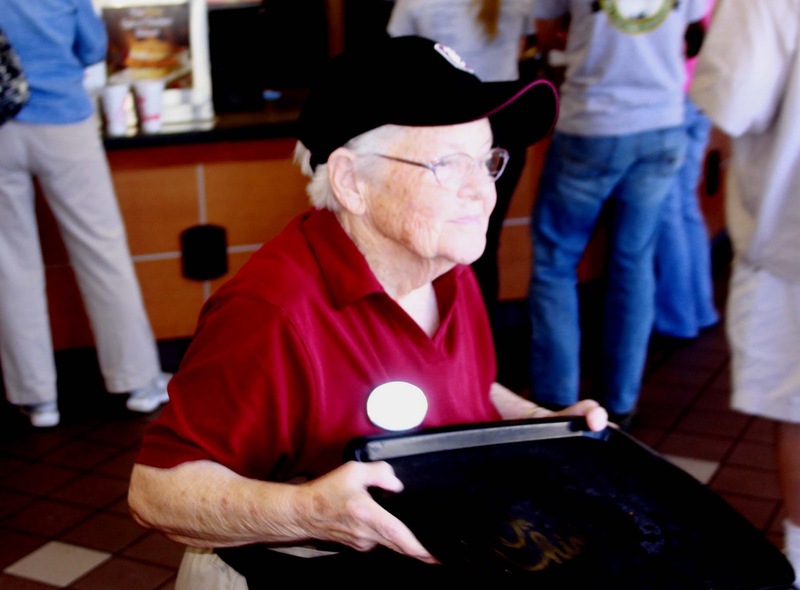 "When she came in, I thought how wonderful it would be to have her as a greeter for a while, to be a grandmother to everyone," the manager recalled. 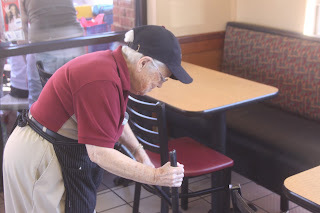 She wouldn't work in the kitchen or in the drive through a window or even the front counter. Laura's shift starts at lunch and lasts only three hours. It is her job to keep the place neat and tidy. She really doesn't mind those who leave their tables and booths in a mess. After all, it's her job to make the eating areas so clean that you wouldn't know anyone had eaten there in a while. One customer, who requested anonymity, keeps an eye on his drink, careful to move it every 20 seconds or so, to make sure Mrs. Laura doesn't come by and pluck it up. And, she does that six days a week. She reserves the seventh day for the Lord and her family. 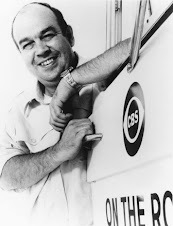 David Roberts once thought that when she first came to work that Laura would work for only a short time. "Now, she's been here for about 12 years, and " She has only missed a handful of days and her work ethic is unmatched," Roberts continued. On some days, Mrs. Laura has to work up to the strength to get over the normal aches and pains of someone her age just to make it in to work. "She is always in a good mood. 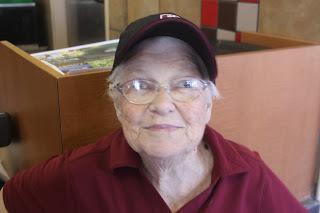 She has been a blessing to us," Roberts observed of his longest serving employee. Laura Darley will celebrate her 85th birthday on Thursday, March 31. Unless her boss gives her the day off, Laura will be working the lunch shift, just as she has for the last dozen years. Laura Darley has no plans to quit working. "I love the people who come here," she says. "And, I will keep working as long as I can," she continued. So, if you want to wish her a happy birthday, stop by at lunch and there you'll find Miss Laura, doing what she does best, being a grandmother who picks up your crumbs and your trash and never fusses at you.